Our interventional cardiologists and cardiac surgeons are skilled in cardiac catheterization as well as minimally invasive and hybrid procedures for the diagnosis and treatment of pediatric cardiac conditions. Blood presssures in different heart chambers and blood vessels are recorded. Oxygen content of the blood in each heart chamber is evaluated. Dye is injected through the catheter. Angiograms (X-ray movies of the dye's movement) are filmed so that the details of the cardiac problem are recorded. 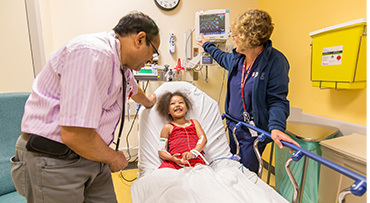 The results are reviewed at the cardio-surgical conference, a weekly meeting of cardiologists and surgeons at the University of Chicago of Medicine Comer Children's Hospital, which gives your child's cardiologist "second and third" opinions for any decisions made in your child's care. Cardiac catheterization is used to diagnose or to treat heart defects, including arrhythmias, congenital heart disease, valve disorders, heart failure and more. In some cases, cardiac catheterization may prevent the need for open-heart surgery. 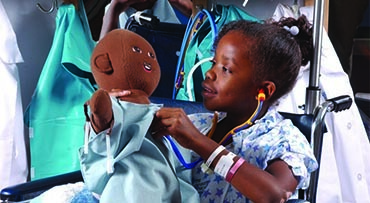 Comer Children's has dedicated suites for cardiac catheterization procedures. These newly designed rooms are equipped with the latest technology, which allows us to provide the best care while minimizing risks to our patients. UChicago Medicine is the first medical center in Illinois to offer radiation dose reduction with real-time monitoring for patients in the catheterization lab. Minimally invasive procedures are performed through tiny openings in the chest, eliminating the need for a large incision through the breastbone. These procedures offer many benefits. In addition to a reduction in scarring, minimally invasive procedures enable patients to recover quickly, experience fewer complications and spend less time in the hospital. Some patients may require surgery and catheterization. Previously, these procedures would have been done on separate occasions and in separate rooms. Today, Comer Children's offers advanced hybrid operating rooms that unite the surgical suite and the cardiac catheterization lab. This enables surgeons and interventional cardiologists to perform multiple or complex procedures in one setting. It also allows cardiologists and cardiac surgeons to do repairs on the heart while it's still beating, which eliminates the need for breathing tubes or additional medication after the procedure. In addition to enhancing patient safety, this reduces recovery time significantly. The hybrid operating room also enables us to perform procedures without having to transfuse blood. 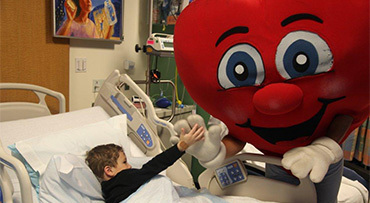 Daniel Gruenstein, MD, chief of the section of pediatric cardiology, performed the first hybrid repair for hypoplastic left heart syndrome in the upper Midwest and has performed the most procedures of this kind in Chicago. He has taught other cardiologists how to perform hybrid repairs, including hypoplastic left heart syndrome repairs, ventricular septal defect closures and stent placement.